LEGAZPI CITY (Mar 19) – After more than a year of waiting residents listed with partially damaged houses by Typhoon Nina – considered as one of the strongest typhoon to batter in Bicol Region in December 25, 2016, will soon be relieved as the first tranche of the Emergency Shelter Assistance (ESA) was formally transferred to the Provincial Government of Albay from DSWD Regional Office V.
Dr. Eva A. Grageda representing the Provincial Government of Albay received the check amounting to P245,440,000.00 from DSWD-Bicol Regional Dir. Arnel P. Garcia. In her statement Dr. Grageda said the they are finalizing the schedule of payouts to the residents of the following municipalities with partially damaged houses during the onslaught of Typhoon Nina in Albay. 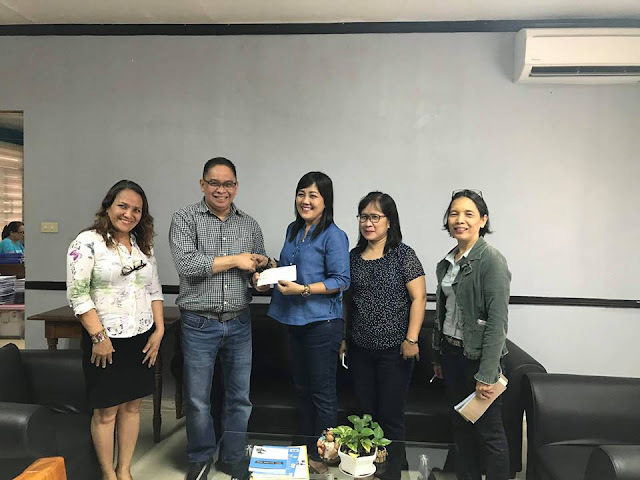 Records shows that each municipality has the following beneficiaries and funds intended for payout to be announced soon: BACACAY - 46 Barangays, 3,625 Beneficiaries P36,150.00.00, CAMALIG - 6 Barangays, 89 Beneficiaries P890,000.00, LIBON - 47 Barangays, 4,135 Beneficiaries P41,345,000.00, MALILIPOT - 18 Barangays, 1,873 Beneficiaries P18,725,000.00, MALINAO - 29 Barangays, 3,248 Beneficiaries P32,450,000.00, OAS - 50 Barangays, 3,276 Beneficiaries P32,760,000.00, PIODURAN - 23 Barangays, 421 Beneficiaries P4,210,000.00, RAPU-RAPU - 21 Barangays, 747 Beneficiaries P7,470,000.00, STO. DOMINGO (Libog) - 19 Barangays, 1,564 Beneficiaries P 15,635,000.00, TIWI - 25 Barangays, 5,581 Beneficiaries P 55,805,000.00.